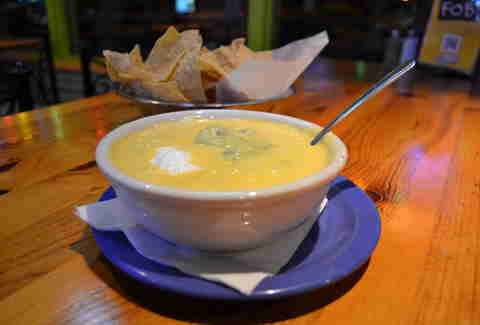 Queso -- with salted chips or lightly toasted tortillas and glacier-cold beer -- is a Texas birthright. In Dallas, it’s a critical link in our food chain. If you grew up here, you ate chips & queso in celebration. 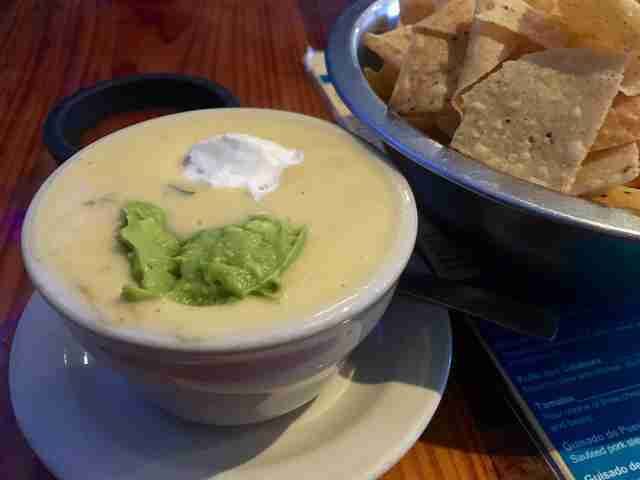 Queso is a verb: you queso with friends, with beers rimmed by lime wedges, at drive-throughs, and in gross quantities at the Blue Goose Cantina. For the uninitiated: queso, at its most common, is a bowl of molten, strangely golden cheese served with tortilla chips for dipping. Insert chip, swirl, and eat. The variations of this iconic dish in Dallas are tears-of-joy good. 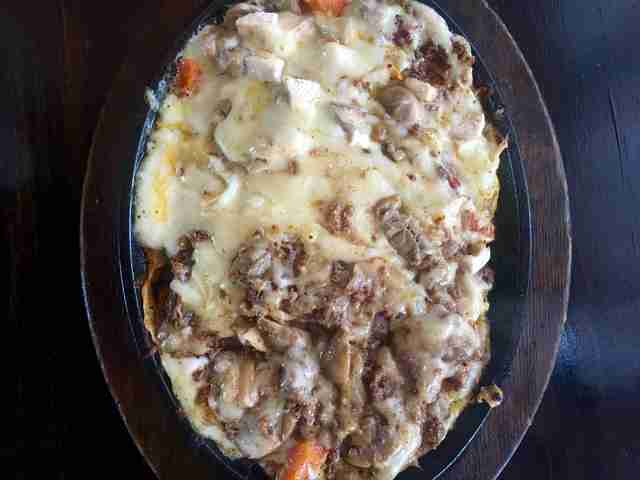 These are the bowls, or sizzling plates, of queso that represent Texas at its finest. 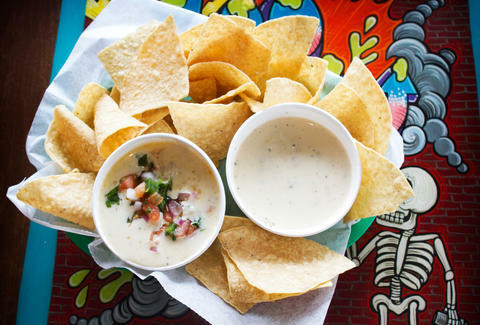 One of life's great simple pleasures is saying the words “queso fundido.” Go ahead, we'll wait. Veracruz Cafe’s variation on the standard Tex-Mex queso is straight from the heart of Veracruz, Mexico: chef Maria Rodriguez places chicken marinated in white wine & garlic, crumbled chorizo, and mushrooms directly onto smoking-hot cast iron, and follows with handfuls of shredded Monterey Jack. The cheese melts into a beautiful cauldron of chorizo oil, marinated chicken, epazote (a vinegary-herbaceous marinade), and mushrooms, and it’s served bubbling hot. Your eyes will roll back like a shark. Avila’s plays our Tex-Mex heartstrings like Stravinsky. 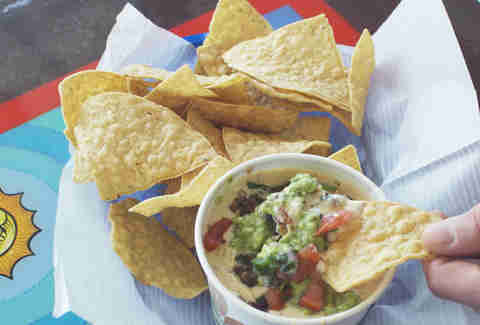 Its “Layer dip” queso, creamy and decadent, is clearly the music of the devil: immersed in the melted cheese is smoky ground beef, spoonfuls of sour cream, and guacamole bobbing on the surface. Dip and swirl with sturdy, salted chips and eye-opening, very spicy salsa (you’ll need a couple of horse troughs of water), and you’ll be washed in comfort. Last time I ate BrainDead’s roasted tomato-spiked queso, I woke up three days later in a basement, hands covered in cheese. BrainDead’s version is asadero cheese melted in harmony with a hash of ground beef, run through with roasted tomato salsa, and topped with salty crumbles of queso fresco, guacamole, and fresh cilantro. Shower lime juice over it, and it will make you forget bad things you’ve done. 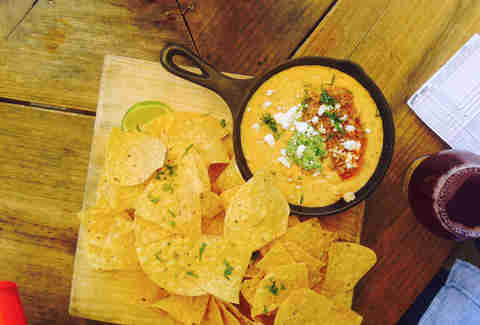 One of the best things you can do as a Dallasite is eat the Queso Flameado at Cuquita’s. Fresh tortillas are made about 20 steps from wherever you’re sitting. A guitarist roams, possibly playing Jimmy Buffett’s "Margaritaville." Its version of queso is startlingly unlike most yellow bowls of melted American cheese: it’s a stretchy, freshly melted, hot, white Monterey Jack, laced with luscious chorizo. Tear pieces off using a tortilla as a handle, and dab on the tomato-forward salsa. Let’s state this up front: Trinity Hall’s queso is melted with Harp lager. You don’t need anything else, right? Beer and queso should be on the Texas flag. 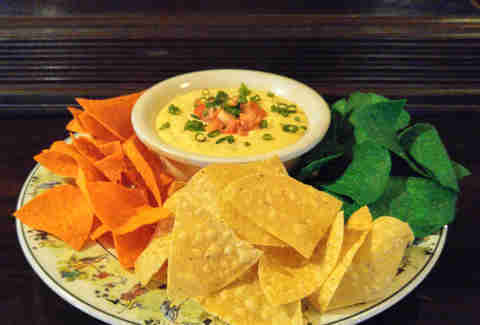 Served with a heavily salted, tri-color chips, this is bar queso that’s a Texas homage to beer cheese dip. Diced tomatoes are heaped on top to give an acidic bite. It’s hot, oniony, and madly addictive. The crawfish-laden queso at Alligator Cafe is pure wizardry. The horizon gathers with storms, a great wind sets upon the Earth... the whole thing. The New Orleans-inspired restaurant blackens thumbnail-sized crawfish tails and folds them into molten cheese. A heap of pico de gallo is laid on top to cut the richness. Reliable and heartwarming, Pepe's & Mito's queso is the melted cheese dip you crave when you want straight-shootin’ Tex-Mex. It’s the good, old-fashioned queso you know. Big-as-flags tortilla chips and endless salsa are rites of passage in Dallas. Coupled with Pepe's & Mito’s queso (add seasoned ground beef if you’re feeling lucky), they become a quintessential triad of Tex-Mex flavors. Let’s all take a moment and thank the universe for bringing Tacodeli to Dallas. A staple in Austin for a while, Tacodeli is doing fast food right. Its food is always big on flavor compared to most fast-casual spots (the salsa combinations are spectacular), and the queso is like an arrow fired directly into your soul. This version is a mix of three cheeses, loaded up with pico de gallo, guacamole, and -- wait for it -- Akaushi beef, a delicious Japanese wagyu cattle breed. This side at the splendid gourmet taqueria is five bucks, which means it’s an immediate must-order. You may see owner Andrew Savoie there, hand-pressing tortillas. 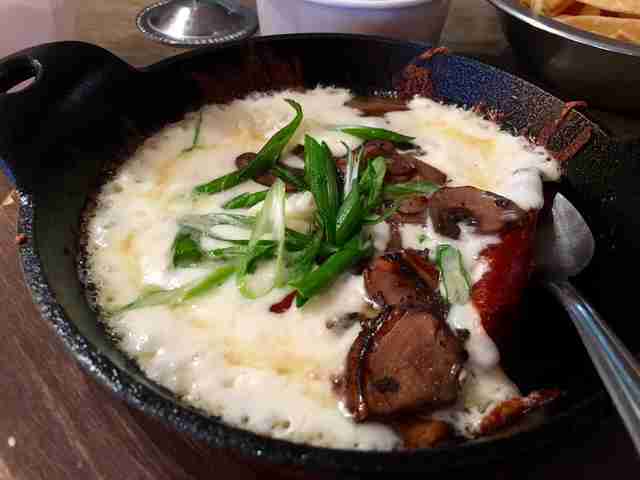 The fundido, a sizzling white cheese with tender mushrooms and sliced green onions, is hilariously good. Slide the mushroomy fundido into Savoie’s fresh tortillas and watch your senses light up like a Christmas tree. No list of the best quesos in Dallas, none, would be right without one of the most iconic dishes in Texas --the Bob Armstrong Dip at Matt's El Rancho. Do not attempt to deny its power. How can you? Taco meat heaped into a melted block of American cheese, topped with dollops of sour cream and guacamole, is health’s kryptonite. It’s vibrantly good, cheesy, melty insanity. Nick Rallo is a writer in Dallas. His reviews on burgers appear weekly in the Dallas Observer, which is why his doctor probably hates him. Follow him @nickrallo.